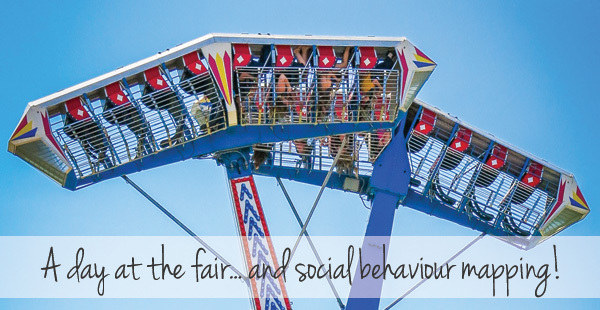 Home / 2018 / June / A day at the fair… and social behavior mapping! Today our family embarks on a journey, a trek that we make annually that takes a lot of mental preparation on my part, and a long nap when it’s all said and done. Today we are going to the fair. It is a jam-packed, high-energy day that inevitably ends in meltdowns or, as was the situation last year, a child getting lost. The kids love the fair and all the rides and games but it is extremely over stimulating with all the noise and lights and people. It is a major event for us and with 3 children on the spectrum and one with significant sensory processing difficulties, to survive the day means that we have accomplished a great feat! 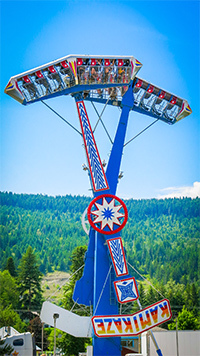 Taking a family of 6 to a fair is a big undertaking, when 3 of those family members have autism it gets that much more challenging. So this year I prepped everyone in the best way that I know how these days; I pulled out my large Social Behavior Mapping whiteboard poster and we started brainstorming what the expected and unexpected behaviors are when you are at a fair. It is a fantastic tool that gets everyone thinking about their actions and the related positive or negative consequences of those actions. Not only do you come up with a list of what is expected and unexpected in a situation, but you go further and talk about/write about how those behaviors make other people feel, what the consequence is and how you feel about yourself. Children on the spectrum have a hard time with thinking about how their actions affect how others feel around them and how certain actions lead to certain consequences. They also tend to have a difficult time in new situations because they don’t know what to expect. Using Social Behavior mapping sets them up for success. Furthermore, by adding pictures you can also give them some context and a better understanding of what the setting is going to look like. You can talk about the sounds they might hear like loud dirt bikes or monster trucks, or bands on a stage. You can talk about the different smells of the wide variety of food at a fair, the crowds of people that you sometimes have to work your way through etc. By talking about the different expectations of the outing, it’s pre-correcting them and helping them to make good choices and also understand why they should choose the expected behavior. And by going over the expectations ahead of time you can simply say “is that expected behavior?” when they are getting off track and they should be able to remember at least the basics of what you went over before leaving for the outing and get back on track. After we filled out our dry erase poster, I took a picture of it with my phone so that we can go over it when we reach our destination. My kids want to do well, they do the best they can in any given situation and sometimes it’s easy to forget that they can get overwhelmed over things that may not stand out to us. Our kids may need a few extra tools to help them navigate this crazy unpredictable world successfully. So next time you find yourself heading off to an event that you are dreading, even if it is just a trip to the grocery store, think about how you can help your child ahead of time to feel proud and successful and at ease. And wish us luck as we head out on our journey! Learn more about Social Behavior Mapping here.